In early March, 2009 a long-awaited dream finally came true for Anglo-Eastern. They could officially announce the establishment of the Anglo-Eastern Maritime Academy in Mumbai, with the first intake of Cadets, straight out of High School, commencing in August, 2009. "A long-time dream come true" said Group CEO, Peter Cremers. "We now have full control of the quality of our crews, from graduating High School to getting their Master's ticket." 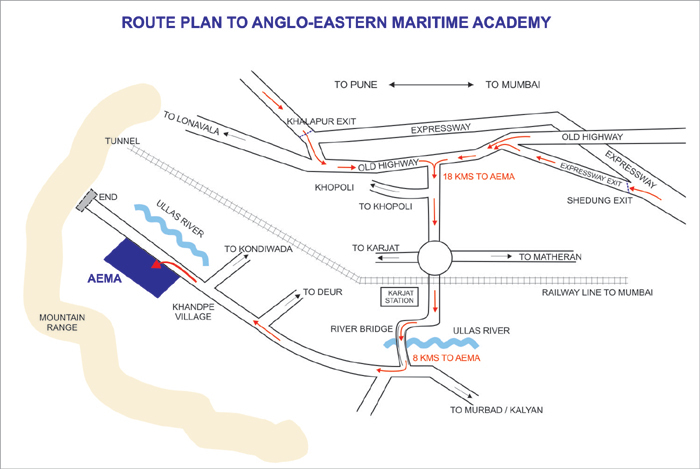 Anglo-Eastern's Maritime Academy sees the acquisition of a 53 acre site, situated in Karjat (near Mumbai), about an hour's drive from the city of Navi Mumbai (New Bombay). Capt. Pradeep Chawla - Managing Director, Quality Assurance and Training commented: "It has been a long wait to realize this strategic goal of being able to fully control the quality of teaching of our young recruits, right from the start. "We aim to build on our existing reputation as a leader in the field of maritime training to become one of the top maritime colleges in the world. Together with our present training centre, situated in Mumbai City, we will have the largest and most well equipped training establishment in India." At present, Anglo-Eastern employs over 550 Cadets onboard its fleet and this initiative will further ensure its long term supply of quality crews in the years to come. CEO Cremers had the last word: "For us this is an investment that has been fully funded by Anglo-Eastern alone. We consider it to be critical to our business. It is a long term insurance for the growth of the company. "We will now be able to add mandatory STCW training to our normal post mandatory curriculum and have our Anglo- Eastern safety culture embedded into our crews, right from day 1." The first phase of development over a 20 acre plot has the infrastructure to accommodate 360 students. It includes an Academic block, Administrative block, Hostel blocks, Multipurpose Hall, Mess and Dining Hall, Faculty residence, Club House, gymnasium, Basketball and volleyball courts, a swimming pool, playgrounds and a huge manmade lake for boating activities. Situated in the lush green environs at the foothills of the Sahayadri mountains, the academy has the perfect ambience for learning and hands-on practical training. The Deck Cadets undergo the Diploma in Nautical Science (DNS) 1 year course under the Indian Maritime University (IMU). Anglo-Eastern Maritime Academy is approved by the Director General of Shipping (DGS) , Ministry of Shipping, and is affiliated to the IMU for the conduct of the DNS course, batches commence in August, February of each year. The cadets were selected based on a stringent selection process which involves an on-line written test, followed by an interview, psychometric test and medical examination. More than the infrastructure, AEMA's greatest strength lies in its faculty. Top level professional, academic faculty and instructors have been carefully chosen based to the special knowledge and skills that they bring to the institute. AEMA intends to go much beyond just teaching the university syllabus. We intend to ensure that the cadet not only acquires good technical knowledge and obtains his diploma, but over the one year in the campus imbibes Officer like Qualities, builds character, develops communication and soft skills and acquires dexterous skills in practical application of seamanship, navigation and cargowork. A culture of safety, discipline, industriousness, teamwork would be infused into his persona so that when he leaves the campus he is an Officer and a Gentleman ready to face the sea. AEMA also conducts the marine engineering training, A batch of 40 Graduate Mechanical Engineers undergo an 8-month marine engineering bridging course prior to their joining the ship as a Trainee Marine engineer. The batches commence in February, June, October of each year. AEMA was the 1st to introduce the Electro-Technical Officer Training as per the 2010 amendment to STCW for batch of 40 graduate Electrical/Electronic Engineers undergo a 4 months "Electro-Technical Bridging Course" prior to joining the ship as a trainee ETO. The batch is commencing in June of each year. One of the biggest plus points of the academy, is that it guarantees the on-board training slots to all its students on the successful passing of the Pre-sea course and subsequent employment on one of the finest fleet of ships in the world.